Ant eggs are tiny, about the size of the period at this end of this sentence. The eggs can be laid year round, but most are laid during summer months. 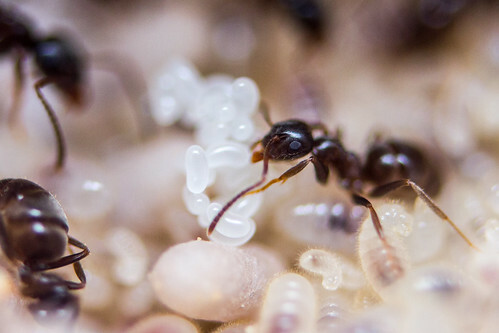 Unfertilized eggs produce male ants (drones) and fertilized eggs produce female ants (workers or queens). Some eggs are eaten by ants and provide extra nourishment. The worm-shaped larvae have no eyes or legs. All they do is eat and rely on adult ants to bring them food. They grow rapidly, molting between sizes. Once a larvae grows large enough, it transitions to the next stage in its life cycle: pupa. Some species attach to the wall and form a cocoon. Other species just lie in the tunnel. The ant is at rest during this pupa stage. Its body is undergoing a lot of physical changes. When the ant emerges from the cocoon, its exoskeleton hardens and it can no longer grow: this is when the ant is now considered an adult. 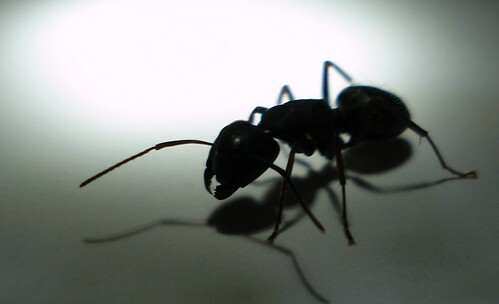 Generally, ants only live for about 90 days. Male ants don’t do any work in the colony. TheyÂ only live a few weeks to a couple months and die after they reproduce. The workers’ first job is to tend to the queen and eggs. After a while their job changes and they work in the tunnels. Their final job in life is to forage for food and defend the colony. Workers are known to live up to 7 years and queens up to 15 years. 1 page summary of the ant life cycle. Detailed information about the various parts in an ant life cycle. Very simple summary of the ant life cycle. This entry was posted in Biology, Supplies and tagged ants, life cycle by Alicia Brown. Bookmark the permalink.